Situated in Les Salles-sur-Verdon, this hotel features a terrace with panoramic views of Lake de Sainte-Croix and the surrounding Verdon Natural Park. Hiking, fishing, and swimming are within 5 minutes of the property. Rooms have a flat-screen TV with cable channels and private bathrooms with either a bath or shower and a toilet. Some rooms have balconies with lake views and other rooms overlook the village and surrounding hills. Continental breakfast with hot drinks, orange juice, croissants, fresh bread with jams, honey and butter is served daily for a supplement. There is a restaurant and bar on site. 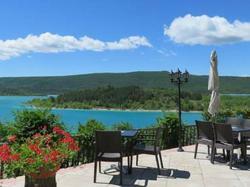 The entrance to the Verdon Gorge is 6 km away and the village of Mousteirs-Sainte-Marie is a 20-minute drive away. Les Arcs-Draguignan Train Station is 55 km away and the Hyeres Airport is 115 km away. Free private parking and free Wi-Fi are available at the property. This twin room features a view of the village and surrounding hills, a cable TV and air conditioning. The private bathroom has a shower and hairdryer. This room cannot accommodate an extra bed. This room features a balcony with a lake view, a flat-screen TV, air conditioning and a private bathroom with a bath and hairdryer. This room has air conditioning, a lake view and a flat-screen TV with cable channels. It has a private bathroom with a bath, toilet and hairdryer. This room has air conditioning, a view of the village and surrounding hills and a flat-screen TV with cable channels. It has a private bathroom with a shower, toilet and hairdryer. This room cannot accommodate an extra bed. This room has air conditioning, a balcony with a lake view and a flat-screen TV with cable channels. It has a private bathroom with a bathtub, toilet and hairdryer. This room has air conditioning, a balcony with a lake view and a flat-screen TV with cable channels. It has a private bathroom with a shower, toilet and hairdryer. This room features access for guests with reduced mobility.